Keelung 2016 International Environmental Art Project in Taiwan is Going Well! I am in Keelung, Taiwan, now for curating the 2016 Keelung International Marine Environmental Art Project. We have 7 international artists creating site specific environmental outdoor sculpture installations around the National Museum of Marine Science & Technology in Keelung, the port city on the northeast coast of Taiwan. The 2016 Keelung artists are Ester Fabregat – Spain, Tsuneo Sekiguchi – Japan, Steve McPherson – UK, Piotr Wesolowski – Poland, Regine Neumann – Germany, Patrick Demazeau – France and Yi-chuian Li – Taiwan. There you can see photos of the artists and the artworks being created now in Keelung. The artists are all making good progress on their large sculpture installations on the theme of “Envisioning the Future of Our Oceans. Our Opening Day celebration is Sunday, June 5 at the NMMST in Keelung. The artworks will remain on view until August 2016 or until they biodegrade. 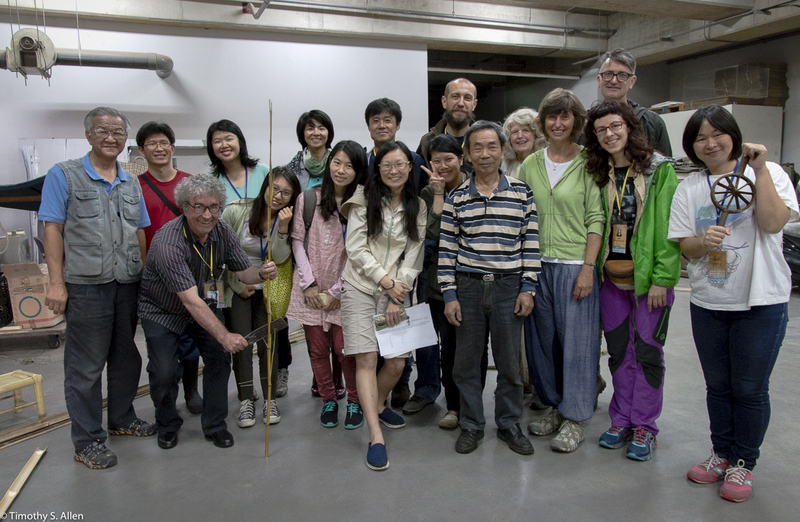 This photo shows the 2016 artists with a local bamboo master who showed the international artists some different ways to work with bamboo!